Want to learn how you can be visible to your dream clients when you’d rather be invisible? no matter how scared you are to be visible, so you can attract your ideal clients. that makes being ‘out there’ a whole lot easier and building your business becomes enjoyable. so you can help people without burn-out or overwhelm. You’re scared of being visible, of being judged, of ‘getting it wrong’, of being overwhelmed. So you stall, you delay, you keep changing your mind on what you want to create, and how best you can help people. And that’s heartbreaking and frustrating. without being terrified or burning out. and to use your talents and gifts to make a real difference in the world AND earn a decent income. The solution is closer to home than you imagined. I want to live in a world where introverts have the confidence to take action on their business goals and build a profitable business doing what they love. I know what it’s like to feel stuck on the starting blocks; to be passionate about helping people with my skills, yet struggle with how to actually sign people up to work with me (even after spending A LOT of time and money on business coaching and marketing training courses). I know first-hand the frustration and hopelessness that comes with trying so hard and still getting nowhere. Not so long ago I was terrified, floundering, and deeply in hiding. I’ve learned how to move through my own fear of visibility, to talk about what I do and get paid to help people. I’ve successfully navigated from a place of terror, to feeling comfortable and confident about who I am and what I can offer – and I can help you do the same. I want to say a huge thank you for what you’re doing Ann. This is life changing stuff ! Before we started coaching, I was struggling with going into new environments unprepared, meeting new people and trying to do business. Having gone through your programme I’m now feeling happier in myself and much more confident. Now I feel I can put myself out there, try it and learn from it. As a direct result of Ann’s help, I got paying clients much sooner than I expected! 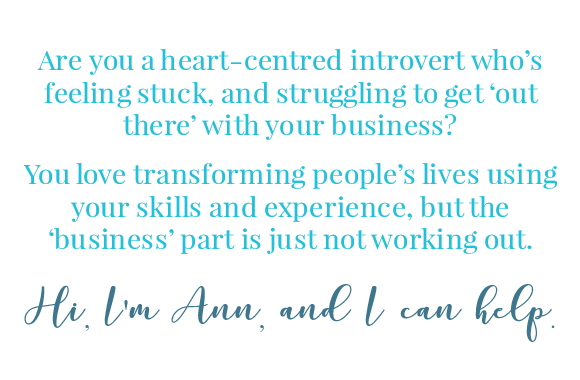 Before I started coaching with Ann, I was feeling overwhelmed, confused and not sure where to start. I needed someone to show me step by step how to set up my business, and to tell me what to do first. Ann’s support was fantastic. I now feel more comfortable in talking to women about their experiences, and I realise that there is a huge need for the work that I do. And I got paying clients much sooner than I expected! I would highly recommend Ann’s services to others. Working with such a lovely, sensitive introvert was the best decision I ever made!